An eBook boxed set that features the first three of A.J. Jacobs's riotousand surprisingly informativeventures into experiential journalism. The Know-It-All: Puzzle along with A.J. as he endeavors to readand retainthe entire encyclopedia, and discover what exactly it is he learns along the way. The Year of Living Biblically: Discover what life would be like in the 21st century if you lived precisely by the dictates of the Biblethe insights gained about religion might surprise you. 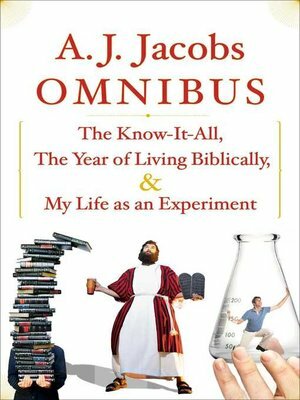 My Life as an Experiment: Join A.J. on a roller-coaster tour of life as a human guinea pig: he explores both the perks and pitfalls of various undertakings in a series of charming essays, including those titled My Outsourced Life" and "My Life as a Beautiful Woman."